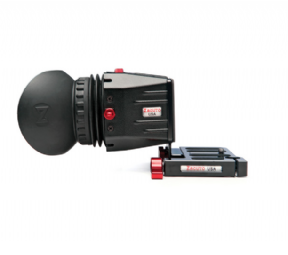 The Z-Finder Pro 2.5x for 3.2" Screens from Zacuto is an optical viewfinder that videographers may find necessary for shooting sharp, stable video on DSLR cameras like the Canon 5D MkIII, Nikon D800, or others with the same size LCD display. Whether shooting handheld or on a tripod, the Z-Finder Pro turns your camera's 3.2" LCD screen into a clear, easy-to-focus viewfinder that lets you see your image in magnified detail, even under the brightest sunlight. Just as crucially, the Z-Finder Pro provides an extra degree of handling comfort and a crucial point of contact--between camera and eye--that adds stability to any handheld video. The Pro 2.5x version offers an adjustable diopter for near or far sighted users, and the LCD image is enlarged by a factor of 2.5x, so you can see every detail for pinpoint focus. The diopter's extended range of -4.75 and up makes it especially useful for those who are nearsighted. The Z-Finder attaches to your camera via the included Gorilla Baseplate and mounting frame, which mount to the bottom of your camera using a standard 1/4"-20 screw. A non-stick rubber backing ensures a tight fit and prevents scratching of the LCD screen, so that the entire Z-Finder snaps off easily when not in use. Once detached, the unit can hang conveniently around your neck from the included lanyard. Note! If you already have a Z-Finder, you can purchase just the Z-Finder 3.2" Frame for small body cameras. 40mm diameter lens for excellent light throughput. Allows 3.2" DSLR camera displays to have correct form factor for video. Field of view perfectly matches 3.2" LCD screen size.